Guns and ammunition in the motion for detention pending trial in the case against Christopher Paul Hasson. POLICE IN THE US have arrested a Coast Guard officer who gathered weapons and drafted a list of Democratic politicians and media figures whom he considered killing. Christopher Paul Hasson, 49, an admirer of Norwegian mass murderer Anders Breivik, was arrested by police last Friday on gun and drug charges. Police also seized a number of weapons from Hasson’s home in a suburb of Washington DC, according to court documents unsealed yesterday. District Attorney Robert Hur sought a motion to detain Hasson until his trial, claiming that he intended to “murder innocent civilians on a scale rarely seen” in the US. “The defendant is a domestic terrorist, bent on committing acts dangerous to human life that are intended to affect governmental conduct,” he said. Hasson, who was arrested on Friday, is being held on drug charges and for illegally possessing firearms and ammunition. 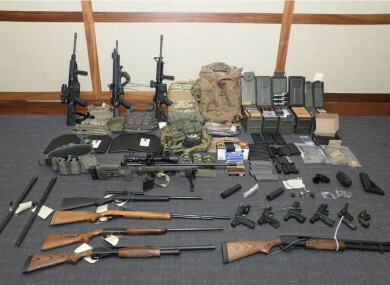 The US Attorney’s office said 15 guns and over 1,000 rounds of ammunition were recovered from his apartment in Silver Spring, Maryland, along with steroids and human growth hormone. Prosecutors said Hasson identified himself as a white nationalist for over 30 years and advocated for “focused violence” to establish a white nation. They added that he routinely looked through the manifesto of Breivik – who killed 77 people in Oslo in 2011 – on amassing firearms and how to compile a list of targets. A spreadsheet of potential targets included Democratic House speaker Nancy Pelosi, Democratic Senate minority leader Chuck Schumer, and Democratic Representative Alexandria Ocasio-Cortez. Media personalities on the list included CNN’s Don Lemon and Chris Cuomo and MSNBC’s Chris Hayes and Joe Scarborough. Prosecutors said his internet searches included queries such as “most liberal senators”, “where do most senators live in DC” and “are Supreme Court justices protected”. They say that Hasson began gathering his weapons collection in 2017, and that he had also expressed a desire to obtain biological weapons. Hasson, a lieutenant in the US Coast Guard, had been working at Coast Guard headquarters in Washington since 2016 as an acquisitions officer. He served in the US Marine Corps from 1988 to 1993, and also spent two years in the US Army National Guard. He is to appear before a court in Greenbelt, Maryland, later today. Email “US police foil plot by Coast Guard officer to kill top Democrats and prominent media figures”. Feedback on “US police foil plot by Coast Guard officer to kill top Democrats and prominent media figures”.